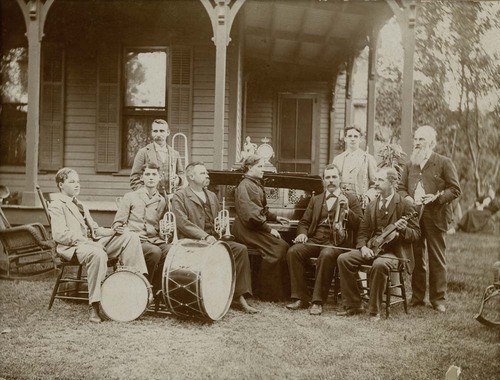 A photograph showing members of the Clay Center Orchestra seated on the lawn of J. C. Johnston's residence located at Blunt Street, between 5th and 6th Streets, Clay Center, Kansas. Pictured are: J. C. Johnston, trombone; George J. Hood, flute; Ed Newell, clarinet; Cecil M. Wickstrum, drum; Mr. Sanders, cornet; Alfred Nordstrum, cornet; Mr. and Mrs. Higgins, piano and violin; and Mr. Bowers, violin.